The bite of winter penetrated my feet as I stood on the cold tiles of the bathroom floor. Shaking from the morning cold, I grabbed my long sleeved Henley shirt from the back of the door and pulled it on over my head, buttoning it up to the top, and tugged on a pair of corduroys. Winters in Louisville were only ten degrees or so warmer than Chicago, so I was thankful I’d brought all of my winter clothes with me. Thank God for mukluks. They locked in the warmth of my heavy woolen socks. I shuffled through the kitchen door and filled the coffee grinder with French Roast. The smell of freshly ground coffee filled was intoxicating, as I picked up my cookbook and thumbed through the pages. Heavy thumping reverberated overhead as bright sunlight made its way through the antique glass of the side door and flooded the kitchen. The boys were up! It was time to begin my first breakfast as a city-certified honest-to God innkeeper. Had to focus. I’d never done this before, and didn’t really know where to start. The night before, ten healthy looking farmers, had checked into my inn. I felt a little overwhelmed as they marched into my small Victorian parlor. Ned, the burley [sic] leader of the group stood at least a half foot taller than all the rest, his bushy red hair crying out for a good hair cut and some styling. His checked shirt and carefully pressed overalls gave him away. “I’m a dairy farmer, missus. We all come down from Wisconsin to give your Farm Machinery Show the once over,” he announced. He thrust a huge hand forward and smiled broadly. “This here is Charlie. This is Al and James.” He went on down the line until he’d introduced every last one of them. “Well. I imagine you boys are tired after such a long drive. I’ll take you up to your rooms so you can get a good night sleep” I grabbed five keys from the reception desk and started up the stairs. They groaned with the weight of each of the boys. “There are snacks and drinks in the dining room. Just help yourselves,” I reminded them, then deposited two in each of five rooms, being sure to tell them all about locking the front door when they went out and coming down to breakfast at the appointed time. The next morning, my house echoed with the sound of boots on my hardwood floors. Soon my week-end visitors would enter my dining room, ravenous, ready for breakfast. Without an assistant or any help, I was on my own this week while the Farm Machinery Trade Show, which brought 40,000 farmers to Louisville Kentucky, flourished. I had had no idea what the Farm Machinery Show was, or that Louisville was fifth in the United States for conferences and trade shows. But, with the help of a couple of the local inn keepers I‘d befriended, I managed to fill up my guest rooms and open my doors on time. In an effort to recoup some of the money I’d spent on start up, I decided to rent all five bedrooms including my own and sleep on a roll-away in the little hall outside the kitchen. The roll away wasn’t too comfortable, but I’d fallen asleep happy, thinking about all the money I’d make that weekend. I was more concerned about the fact I knew nothing about running a bed and breakfast and no business experience. The whole thing was totally new to me. But, I kept thinking, how hard can it be? I’ll just learn on the job. I pushed the thermostat up to sixty-eight and turned on the oven. Warm air permeated the room and the heady smell of French Roast energized me as I tied the strings of a fresh apron around my waist. I carried a pot of fresh coffee into the dining room and placed it along with a pot of hot water on the hot plate next to the blue and white Meissen-ware coffee mugs. The thought that I’d never worked in a restaurant or hotel and never prepared a breakfast for paying guests, never mind ten of them, made me nervous and I wasn’t sure my plans were on track. I wanted my first breakfast to be flawless. I was a good cook, but I’d lived alone for years and ate mostly Cheerios for breakfast, which hadn‘t exactly prepared me for gourmet mornings. So I called Doris the night before for help with the menu. I told her I’d decided on a sausage ring, scrambled eggs, Grand Marnier French Toast, fruit cup, muffins, toast, orange juice, coffee or tea…. “Grand Marnier French Toast? What about Grits and Sausage gravy? They’re farmers. And why so much food? Doris asked. “Just because they’re farmers doesn’t mean they won’t like Gourmet food” Doris was probably right about there being too much food, but I wanted to make sure I covered myself. When the oven was hot enough, I put the sausage ring in and started breakfast. As soon as it finished baking, I took it out of the oven and unmolded it onto a glass cake plate. It sat there looking miserable, all battleship grey and unappetizing. It needed to be browned, so I popped it back in the oven and went out to the dining room to make sure everyone had orange juice and coffee. The minute I returned to the kitchen, I heard a loud bang in the oven. The cake plate had exploded and, through the glass door, I could see it was melting all over the inside of the oven. Of course, a cake plate is not meant to be put in the oven, I chastised myself. When I opened the door, a thick cloud of black smoke gushed into the room, stinging my eyes and forcing me back against the worktable. Grease oozed out all over the floor and the smoke set off the fire alarm. I ran around the work table to get the roll of paper towels from the kitchen sink and slid halfway across the room. After grabbing onto the edge of the worktable, I straightened myself up, grabbed the paper towels and threw large strips of it all over the greasy floor, then hurried to turn off the screeching smoke alarm. Thank God there was a stone bearing wall between the kitchen and dining room. You couldn’t hear a thing on the other side of it. I peeked in on my guests to make sure, just as a Vivaldi Concerto Grosso wafted across the room. It was such a lovely picture. I grabbed a nearby ladder and leaned it against the wall under the alarm, then climbed up to the twelve foot ceiling and yanked out the batteries. Back in the kitchen, I got some ham from the fridge and started plating the food as fast as I could. Splat! Something cold and wet hit the back of my hand. I looked up and saw water drizzling from the chandelier onto the prep table. It just missed the fruit bowl. Oh my God! We’ll all be electrocuted. The water trickled its way across the ceiling from where the bathroom was on the second floor. The drywall bulged downward about ready to burst. I knew I couldn’t do anything about it then. Just pray hard, I thought, and get the food out fast. I grabbed a bucket and set it on the table to catch the drips and began repeating to myself: Stay focused and composed. And keep moving! For a moment, the fiasco in the kitchen came to a standstill. I opened the door to the dining room and walked through with a loaded tray of breakfast food. The boys started clapping and raving about how wonderful everything looked. They were completely unaware of the chaos all around them. As I set each platter of food on the buffet table, they attacked it like crazed animals, brushing me aside to get there first. I watched as the scrambled eggs disappeared, and the French toast dwindled piece by piece. The two largest men in the group loaded their plates to the whopping brim. Eggs, bacon, ham, French toast, everything they could get their forks into. I kept running back and forth to the kitchen to get more muffins and butter and refill the orange juice and milk pitchers. I managed to make more coffee and slip in a few more pieces of ham amid dangerous stabs of fork tines. “Ma’am, can I please have another glass of milk” became the morning mantra. By the time they were finished the milk was all gone, the orange juice carton was empty, and all of the muffins I’d stayed up making the night before had disappeared. There was not a shred of food in sight. It was like the locusts had come and gone. I learned a couple of important lessons that day about letting guests loose to devour the buffet table. It’s best to control the food portions by plating everything in the kitchen and serving at the table. And don’t make so much food. If my guests hadn’t been men with large appetites, I would have thrown away half of what I made. The health department had already warned me I couldn’t serve leftovers. Tomorrow, it would be biscuits and gravy. God I was tired, but there was no time to rest. I had to clean everything up then run to the grocery store for milk and orange juice. I fell into my kitchen desk chair, coffee pot still in hand, trying to erase the sight from my mind of those ten stalwart farmers devouring all that food. Then I remembered the grease and paper towels all over the floor. My feet were killing me and my whole body was aching. I got up and yanked off my greasy, wet apron and pulled my shirt off over my head. Sweat was running down the back of my neck catching strands of my hair and turning them into twisted ribbons of wet liquorish. I grabbed a clean shirt out of the dryer, tied on a clean apron, and walked out into the cold air on the deck. I collapsed onto the chaise lounge and began taking in deep breaths of clean fresh air, my wet hair cooling my neck as I lay against the striped canvas. I closed my eyes against the morning sun. The cold air caught my exhaled breaths and turned them into smoky wisps that rose slowly toward the clear blue February sky. Wow! What a morning that was. And that was only the first one. All I could think of was how was I ever going to make any money if I kept feeding groups like that one? Breakfast could cost more than the price of a room. The crisp winter chill urged me from the chaise lounge back into the warmth of the kitchen. I decided to call Doris to see if she had any suggestions for feeding large groups of farmers. I hoped the next day would be different. Oh my God, I had forgotten all about the plumber. I needed a plumber. I didn’t even know one in Louisville. But I needed to find one before I did anything else. I headed for the phone to call Maggie. She knew everyone in Old Louisville and always got the best deals on everything. Maggie and I never stayed mad at each other for very long. Despite how I felt about Christmas and Thanksgiving and the neighborhood, I wasn’t about to hold that anger and disappointment inside. This is something I learned from my mother a long time ago. “Let go of the anger,” she would say. “It will only eat at you and make you depressed.” I’d learned that lesson well. Maggie could be a big help at times, especially when it didn’t involve emotions. She gave me the numbers of a plumber and a general maintenance man who lived in the neighborhood. I called both. After reaching and pleading with the plumber for a few minutes, he finally agreed to come by after breakfast and try to assess the damage. It was more serious than I thought. The call to the maintenance man would have to wait. The plumber arrived just after my guests finished breakfast and took off for the Convention Center. They would be gone for the day. We walked into the kitchen together. He stood and stared at the ceiling with his hands in his pockets for what seemed like hours, occasionally running his fingers through his hair slowly. A slight ringing in my ears was beginning to unnerve me. “Well?” I asked. ”Can you fix it?” The ringing in my ears had gotten louder. I took a deep breath and looked him squarely in the face. My heart was pounding so loud I could hardly think. I pictured a troop of plumbers, wrenches and axes in hand, smashing the hell out of my bathroom wall leaving dark gaping holes that oozed dirty, icy water. And me pleading with them not to leave as they walked off the job. My stomach was doing flip flops. “How much will it cost?” I took another deep breath and tried to calm down. I kept thinking, how will I ever pay for this? “It’ll have to wait until Monday when my guests check out,” I told him. That way I’d have a little time to think about how I was going to pay for the damage and maybe ask Maggie and Doris for advice. The front door slammed shut and I walked back into the kitchen and started cleaning up the mess, thinking about ways to get some extra money. I managed to soak up the rest of the grease in the kitchen with more paper towels and mop the floor. I filled the dishwasher with breakfast dishes, sprayed the inside of the oven with oven cleaner, and wiped off all of the counters and the kitchen table. I had always been good at house cleaning. In fact, I found it therapeutic. A little more relaxed, I wandered into the parlor and collapsed into a comfortable wing-backed chair. I thought maybe I could do some catering or teach school part time, or borrow some money from Maggie. She had come into a huge heritance when her mother died last year. I needed to get my wits together and come up with something fast. I’ve always had the notion I could do just about anything I set my mind to. That may have been in the back of my mind when I decided to open up a bed and breakfast in the first place. But I never wanted to be in business in the first place; I just wanted this house. I sank back into my wingback, and stared at the ceiling. It had been a little over a year that Maggie and I stood face to face under the original gas-light chandelier that hung overhead. At the time, the house was empty and for sale. “Why don’t you open a bed and breakfast?” Maggie had asked. I hesitated for only a second or two. “What a great idea,” I said, not having the slightest notion of what a bed and breakfast was all about. I never thought of one as a place of business. I had stayed in only a couple. They were comfortable and inviting places to get away to, to relax in. They all had beautiful antiques, down comforters, and gracious hosts serving gourmet breakfasts. I never saw the other side of it. I made a decision right then and there that changed my life forever. I would go ahead and do something I knew absolutely nothing about. I didn’t know it at the time but I was about to spend every cent I had saved for years, my annuity, and my severance pay from the Chicago Public School System on an historic home in Old Louisville, Kentucky. Furthermore, I was going to turn it into a bed and breakfast. I loved trying new things like: Gateau of Vegetable Crepes, Spinach-herb Quiches, Crois­sants au Gratin, and Terragon Eggs in Puff Pastry. All are won­derful gourmet dishes. Most of my guests loved them, but every now and then, a guest or two, or three just wants down home bis­cuits and gravy or plain ole scrambled eggs. Well, I could do that too. In fact, I’ve had the scrambled egg thing down pat. When I first started making breakfast for 8-10 people on a reg­ular basis, I discovered I needed a few menues that would be easy to do for a large group, or in a situation where my help didn’t show up, or when I had come downstairs late in the morning, with only ten minutes to get it all together. Or maybe I forgot to go shopping and the only ingredients I had dictated the kind of breakfast I could make. I most often had eggs on hand. I was never big on fried or poached eggs so I spent most of my time perfecting the scrambled egg. Most people like scrambled eggs, adults and kids alike. Some like them plain, some with cheese, and some with ketchup or chili sauce. Some even like sauteed mushrooms, tomatoes, or spinach stirred in. Kids seemed to prefer them plain or with cheese. They didn’t want cream cheese, or feta, or mozzarella. They wanted plain ole American or, maybe, mild cheddar. I could do that, but my specialty was scrambled eggs with cream cheese, onion, chives, basil, and dill. Here is my take on “Gourmet” eggs. They are fabulous! And my guests, except for some of the kids, love them. I get a lot of positive feedback. Besides liking the flavor and ingredients of the eggs, they also like the consistency and the appearance. To me, making scram­bled eggs correctly is an art. When I was first exploring the best way to prepare them, a fellow innkeeper suggested microwaving them. I tried it and they did puff up nicely and look appetizing, but they were rather insipid. For some reason, the microwave cooked the flavor right out of them. I wanted more control, and the only way to get it is with a heavy, seasoned, wrought iron frying pan and a rubber spatula. There are several things you must and must not do when pre­paring scrambled eggs. First of all, if you cook for over 4 people, you should mix them in the blender but for not too long. You want air in them, but you don’t want them to be overly foamy. Sec­ondly, never water them down with milk or even cream. Next, before you cook them, always melt a liberal amount of butter in the pan and have the pan very hot. Not too hot, you don’t want the butter to turn brown. Test the pan with a sprinkle of cold water. If it sizzles, you’re ready to add the beaten eggs. Now, and this is one of the most important parts, start with the flame on high, but gradually lower it, as you slowly cook the eggs. Scrambling does not mean swishing the eggs around furiously in circles. The proper motion is a pushing motion, back and forth slowly, as the eggs begin to coagulate. Be sure you’re scraping all the way to the bottom of the pan. If you’re cooking for kids, try using shredded cheddar cheese. I hate American! Do not add the cheese until the eggs are almost fin­ished. You don’t want them too wet or too dry. They should look like little yellow mounds of whipped cream only they will be more firm. As you’re finishing up, the cheese will be melting. Fold it in carefully. Now if you’re doing the cream cheese version, start out the same way. Sprinkle on the herbs, as the eggs begin to coagulate, then add 3 or 4 large dabs of Philadelphia cream cheese with chives and onions. Place the cheese in different places around the pan, so it will be easier to work in and distribute. If your eggs finish before your family or guests are ready to eat, you may leave them in the hot pan and cover with tin foil until ready to serve. If they will be sitting in the pan a while, don’t finish them com­pletely. You don’t want them to get hard in the hot pan. You want them firm, but not hard or, on the other hand, not wet and runny. Serve your eggs with ham, bacon or sausage and hot buttered toast, biscuits or croissants. Do Not let them get cold. Cold scrambled eggs are terrible! Nancy was born in Detroit, but spent most of her life in the windy city of Chicago. She worked as a teacher in the public school system for 30 years, and has been writing for all her adult life. 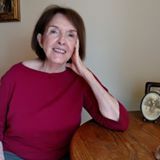 She is currently working on on a second memoir: the story of how her grandparents adjusted to moving from a small farm in North Carolina to the booming town of Detroit in the 1920s during prohibition.